Take your festive brownie game to the next level with these decadent dark chocolate brownies spiked with boozy mincemeat and a hidden shortcrust pastry bottom. I don’t know about you but I am definitely getting into the Christmas spirit. One of the best things about being a food blogger is that you can justifiably start talking about Christmas and eating Christmas food months before the big day. I reigned myself in this year and didn’t start too early but in years gone by I’ve started thinking about Christmas recipes in January (no word of a lie!!!) But, because of my insatiable appetite for festive treats, you get this recipe for Mine Pie Brownies! What is a mince pie brownie? I’ve seen a few different versions of this recipe – some are shortcrust pastry cases filled with a brownie mix, others are brownies with whole mince pies (pastry and all) inside! For my spin on the mince pie brownie recipe, I line the base of the pan with a classic shortcrust pastry, I then top this with a rich dark chocolate brownie batter, adding in heaped spoon full of mincemeat throughout the batter. When baked you then get a lovely crisp base, soft and squishy brownie with bursts of boozy, fruity mincemeat. It’s the ultimate brownie and mince pie mash up! Out of all the versions I’ve seen I reckon this is the best. You get a good pastry to brownie ratio and they are easy to eat with your hands (which is a key requirement of mine). If these brownies weren’t already good enough, I definitely recommend serving them warm out of the oven with a big spoonful of brandy butter! Begin by pre-heating your oven to gas mark 4 or 180C. Line a 9" square tin with grease proof paper. (See notes). Roll out the pastry until its half a centimetre thick. Cut the pastry into a 9" square and lay in the bottom of the tin. Pour baking beans on top of the pastry and bake in the oven for 15-20 minutes or until the pastry is cooked through. Melt the butter in a pan along with the chocolate and sugar. Once the butter and sugar has melted completely, allow to cool slightly. Once it has cooled, whisk in the eggs, one at a time. Next, fold through the flour and cocoa. Pour half of the brownie batter into the tin, on top of the pastry base. Spoon the mincemeat evenly across the brownie batter before pouring over the rest of the brownie batter. Bake in the centre of the oven for 30-15 minutes or until a crust has formed on top of the brownies but they are bouncy to the touch. Allow the brownies to cool completely before dusting with icing sugar. If you bake brownies as often as I do, you might want to think about bulk buying square foil trays. They are ideal for baking brownies and they are good for transporting them too. (I often make brownies for bake sales at work so these are ideal!) You can get 20 for £10 on Amazon! 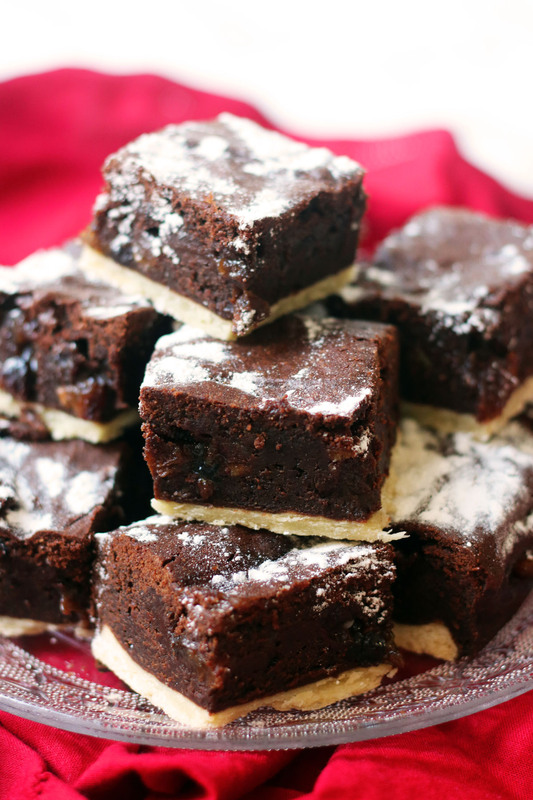 If you like these mince pie brownies then you will love these other festive treats! Oooh I say, these do look good. I like your version a lot, with the pastry base and then the spoons ful of mince meat within the brownie. They look gorgeous! Oh my god yummmm! I’m actually not the biggest fan of mince pies on their own, I’m not sure why… but these look amazing!! Chocolate improves everything 🙂 Such a fun idea! I have been craving brownies lately – think these just might do the trick!